It was requested some weeks ago that I highlight some items in my collection. Great idea! Thank you for the suggestion and to my other readers please go and visit The new Cryptic Garland where this brilliant idea came from. I have decided to start out this (probably extensive) series with the newest item in my collection. I picked up this wee gem yesterday at a church fair for 10 cents. 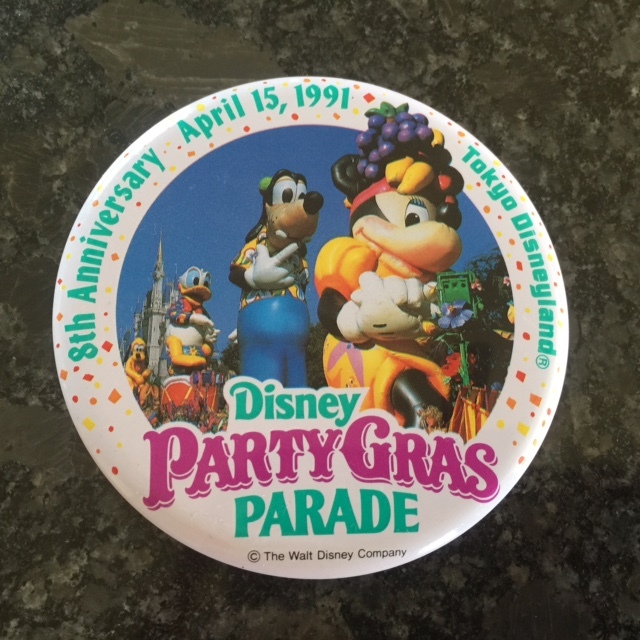 It’s a pin badge (or button for my US readers) commemorating the Party Gras Parade at Tokyo Disneyland. This parade ran from 1991 to 1993 at Tokyo Disneyland and I suspect this may have been a souvenir from the first day of the parade since it’s actually got the date of April 15, 1991 on it. If you want to see the actual parade, I found it on Youtube so have a watch.